The difficulties of women finding work in the horror movie industry were put in the spotlight in a panel discussion at the weekend. As part of Women in Horror Month, four people spoke of their experiences and some of the prejudices that they faced, in a talk hosted at Constellations pub. The event, which attracted more than 100 visitors, was put on by Liverpool Horror Club. Head Cinema Art Director and panel moderator, Mariam Draeger, told JMU Journalism about how the industry became so exclusive. She discussed how in the past physical restrictions kept women back from certain positions in the film industry, saying: “I know a lot of women who wanted to be directors of photography and they went to university and studied it but they realised in the field before you can be DP (director of photography) you have to be a camera operator. 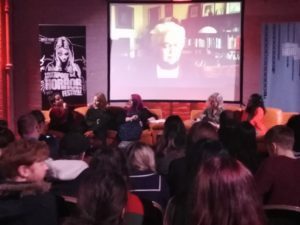 Opinions were offered by people across the industry at the ‘Horror Is No Place For a Lady’ event about preconceptions and stereotypes they had experienced in their respective fields.